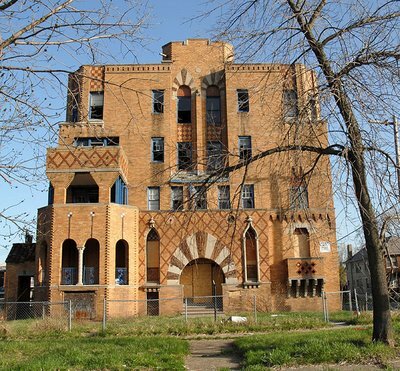 "The Fabulous Apartment Ruins of Detroit." Fabulous Ruins is part of a Detroit history website, Detroit Yes! There are so many (formerly beautiful) crumbling buildings and homes in Detroit, intriguing yet sad for a turn of the (previous) century nut like myself. I'm fascinated by the US from post-Civil War to the 1940s, particularly around 1900. I love Art Nouveau, Arts & Crafts and Art Deco/Streamline Moderne architecture especially. Oh, what a beautiful structure! I share your enthusiasm for Streamline Moderne and Art Deco. this is amazing. i just put a pointer to this on my blog.